← Summer and Winter Complete! Yarn skeins drying after being dyed in a variety of Natural Dye baths. Indigo, Logwood, Brazilwood, Osage Orange, Peach, Lichen, Cochineal, Achiote, Onion skins, Henna, Golden Rod and Madder were all used to make Natural Dye baths. 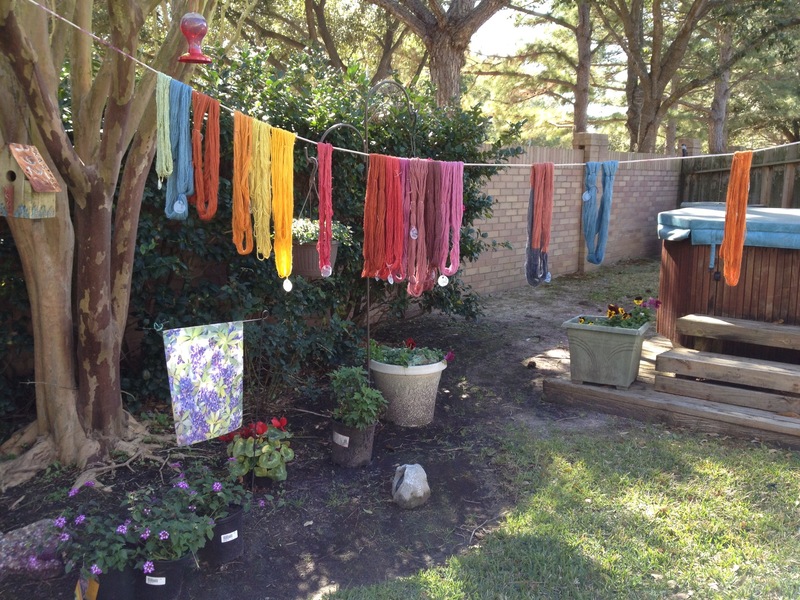 Cheryl, a member of our WOW study group hosted a natural dye day at her home. From her days in Louisiana working at a plantation hosting Natural dyeing and weaving activities, she developed a love of dyeing that she enjoys sharing with others. Wool yarn was my fiber of choice to dye. The yarns were prepared by washing in a mild soap to remove any dirt and or spinning oil. The yarn was brought whetted out for better dye penetration. Some of the dye skeins were put into a mordant bath (Alum). Then the fun began choosing which baths to use to create a wide spectrum of color. This entry was posted in dyeing and tagged Cochineal, Dyeing, Fiberarts, Indigo, Natural Dyes, Yarn. Bookmark the permalink. That would be great fun especially from a history standpoint for me. You have some wonderful colors there. So do you have big plans for them? I’m not sure what I’ll make. There’s about 2 oz. of each so maybe enough for a throw. Will have to think on that.